Everyone wants to have an engagement ring they really love and can flash to friends and family, What happens when the design you loved in your 20s isn’t the design you love in your 40’s? Over the years trends and tastes change, perhaps now you’re thinking you would just like something a little bit bigger and a little bit brighter. Whatever your motivation is more and more people are opting to redesign their old rings. After all you’re looking at it sitting on your finger every day so it’s important that you love it! If you’re thinking of adding a new lease of life into your rings we’ve put together some of the steps involved so you have an idea of the process. We will always be happy to advise you on designs that would look nice, but it can help to have a starting point of what you like. So we suggest looking around online at some designs. Pinterest is a great website with endless photo suggestions that will help give you some inspiration. 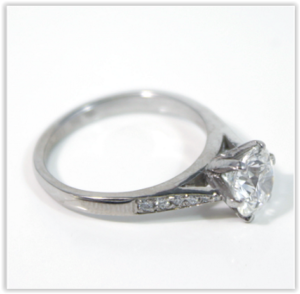 Bring your jewellery along with any images of designs you like into us. We use the latest CAD software to create 3D images of what the new ring will look like. We can create a few different styles for you to have a look at to make sure you’re 100% with the design we choose. Once you have settled on a style based on the images we designed, next we will 3D print a wax model of the ring. At this stage you can try it on and have a look at the size and shape to make sure you’re happy with how it looks. We will now get the new ring cast in metal, once this is done we will remove the stones from your original ring and they will be ready to set into the new band. 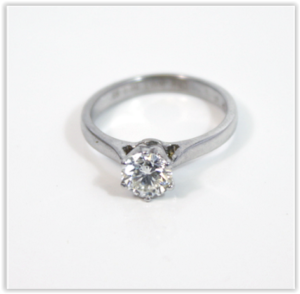 After the stones are set your ring just needs to be polished and is ready to take home. A lot of people can be emotionally attached to the story behind their original ring, upgrading doesn’t mean that you have to lose this completely. If you are increasing the size of your centre stone, than the original diamond could be used to create a pendant so it’s still held close to your heart. 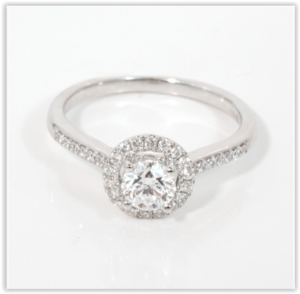 Or if you are changing the setting style than we could always replace the diamond in your original band with a coloured stone to keep as a dress ring. If you would like to blow the cobwebs off your old jewellery, than we would love to help you create something you can treasure. If you can imagine it, we can make it…. Take a look at some of our previous redesigned and custom made pieces here.